A series of reviews of books to be featured at the Amelia Island Book Festival – 2010. Reviewers represent a broad spectrum of community readers and writers. 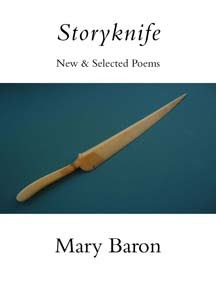 Poet Mary Baron will be at the Festival, Feb. 12-13, 2010. Mary Baron, Professor of Writing and Literature at UNF Jacksonville, will be featured at the Amelia Island Book Festival in February with her presence and her books of poetry. As a poet myself, I have read with great interest her “Storyknife, New & Selected Poems,” and an earlier book “Wheat Among Bones.” The ending poem in “Wheat Among Bones” is entitled Chiaroscuro, and in tandem, something that appears on the back jacket personifies just that in a lovely, back lit, mysterious photo of her that made me want to move closer to this poet -- find her in her poems. The first poem in the “Bones” book is called Christening, wherein Ms. Baron tells us she was named Mary, “after Nanny, that fierce old lady.” Well, Ms. Baron is fierce, but I don’t know about old. The poems are alive, concise, touching, and passionate, with satisfying final lines without which a poem is not a poem. There simply has to be that hook at the end. Examples: “Endless circles over sand,” - “my blood runs backward out to sea,” - “all day I hear them harden into death,” - “the violence of green after white absence”. Mary Baron knows how to make a consummate poem, and how to end one. She knows, and the poem knows, and they are one and the same. She’s a woman who knows in what room the bell rings. “Watch out, this stuff is dangerous.” Poetry rocks! Reviewer Nola Perez is a poet who grew up on Amelia Island. She writes for local magazines, has published 3 memoirs, 5 books of poetry, and has just finished a new poetry collection, "The Tidal Heart, and Other Poems," for which she is seeking a publisher. Nola is a long-time volunteer for the Book Festival.